I have had the best day - all of it has been "Davine Time"!! Last year I had booked in to do a "Viking Knit" weekend class at "Kay's Artycles" in a charming small town called "Loch". To my dissapointment I had to cancel, as it fell on the same day as the "AFL" Grand Final and my Dad and my football team was playing (boo hoo they didn't end up winning). But then to my delight the class was then rescheduled for this weekend. Thanks to Kay I was able to get as much experience and information in one day so I could get back to Dad tonight. Bill spent the first part of the day instructing Wendy, Alice and myself how to set up the mandrel and weave and draw the chain. I tell you it is not as easy as I thought. I think it will take time and lots of practice to get the tension and look of the weave nearly as good as Bill's work. Later in the day Kay taught me how to finish off the bracelet with beads and a handmad clasp. I just really enjoy spending time with people who are so artistic and talented, it is so inspiring. I know my bracelet isn't nearly perfect but I love it. I will wear it with pride and to celebrate another day pamering myself with some "Davine Time". Wow! This is brilliant! 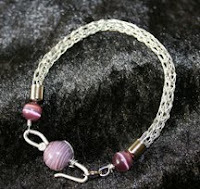 Especially the finished bracelet. Love it. You have every reason to wear it with pride. Items you make of any kind are definitely unique. How wonderful. I have never known anyone who did this work. I have seen it only once. A friend of long ago had a piece very similar in construction. I assumed, wrongly I guess, that it was done by machine. Wow, I am so impressed. Yet another achievement for you. Good for you, the bracelet is striking. Hi Davine! Isn't it uplifting when we create things? I'm always left with such joy - like wow - made it myself! You can indeed celebrate - your creations are lovely!!! Hi Divine, I live at Lismore, N.S.W. I have an absolute love for anything Viking, with close ancestors who lived in Shetland Isles for generations. And, the fire-festivals, seem so fun and pretty. For some reason, there isn't cultural classes in Viking Arts and crafts or an acadamy embracing Scottish history, in Lismore. Numerous eager participants in learning ancient art, Viking knit and crafts. There isn't even a camp or anything. I truly believe that Viking crafts and culture is the perfect knit, many choose natural fabrics, in Lismore. And it could be a theme for the lantern parade, with everyone in Viking dress. Wouldn't that be spectacular. A Nessie lantern dressed with horns and Viking design-work. Or a koala lantern in a kilt. Happy new year. I think today was a good day for all! Pretty cool! Good for you Davine to be able to experience such an event, lovely bracelet as well! I'd love to see something like this being done, it looks very interesting! you should be very proud it's lovely, did you know it's my birthday very soon? It's sounds like a perfect day-- So glad you could attend. And your jewelry is beautiful-- really beautiful. Thanks all for your lovely comments. It does feel good when you create something doesn't it. Top blog, I had not come across 53buddhas.blogspot.com before in my searches! Thanks for sharing the link - but unfortunately it seems to be down? Does anybody here at 53buddhas.blogspot.com have a mirror or another source?